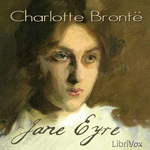 Charlotte Bronte’s classic novel Jane Eyre is narrated by the title character, an orphan who survives neglect and abuse to become a governess at the remote Thornfield Hall. She finds a kindred spirit in her employer, the mysterious and brooding Mr. Rochester, but he hides a terrible secret that threatens their chances of happiness. This is a wonderful reading by Elizabeth Klett. Listen to this book; you will not be disappointed.